Korean Dramas (or K-dramas) make up a decent part of my TV-viewing and I am constantly impressed by how prevalent food is in pretty much every show. 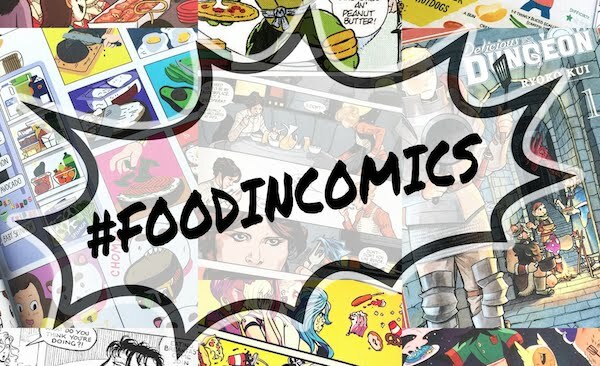 There are whole story-lines that center around food (often workers at a bakery, a bistro, a coffee shop, a traditional restaurant, and more) or food simply makes sumptuous appearances throughout the show in the form of family dinner, a date at a restaurant, or on a rooftop with several bottles of soju (a popular type of Korean alcohol). The inclusion of food is very purposeful and brilliant (did I say I was impressed? ), something I wish American television would incorporate more. Artwork by me! 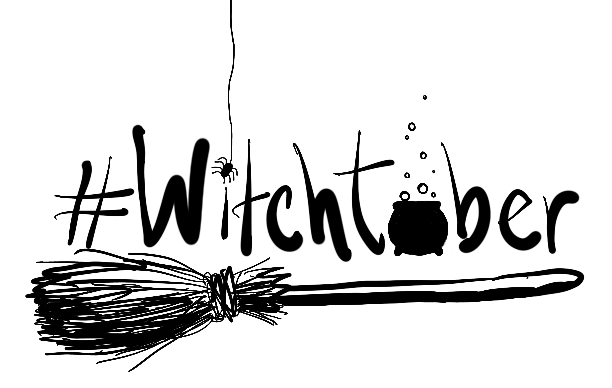 Click through to see it in my shop. One of the first dramas I watched was "Boys Over Flowers" (adapted from a Japanese comic/manga) and there is an important scene where the jerk-rich-boy-main-guy goes to the sometimes-you-wanna-slap-her-main-girl's house and meets her family and they all prepare huge amounts of kimchi together. It's pretty much a bonding ritual/family tradition for this poor-ish family and you can tell the rich boy has never experienced anything like it; the getting his hands messy, the making of food, and the close-knit family banter. It's very eye-opening for the character and the audience gets to see the beginnings of a transformation. Another drama, one that prominently features delicious kimchi, is "Kimchi Family" (also known as "Fermentation Family"). It centers on two sisters trying to keep their family restaurant afloat while looking for their missing father, as well as remembering the life lessons their departed mother taught them when they were little girls via the making of different types of kimchi. There's also romance, action, humor, it has it all. 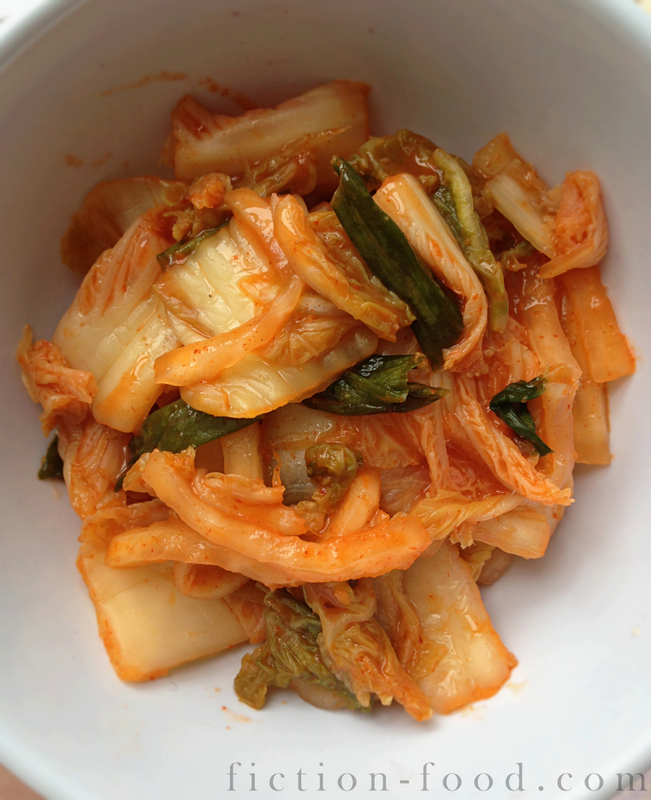 Each episode features a different type of kimchi, often based on the season. 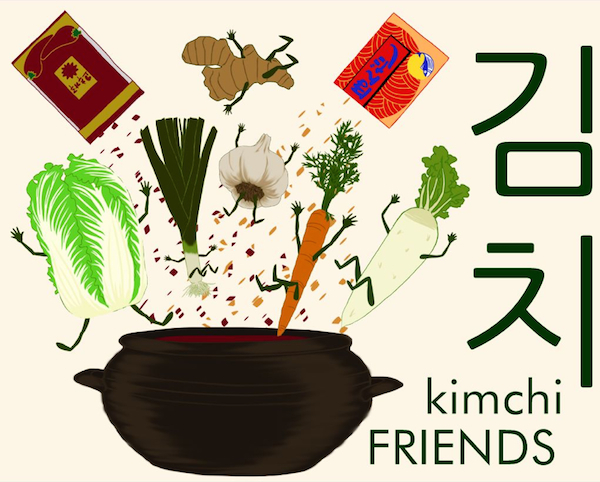 There is a beautiful quote from the show that I can't quite remember but it's an allegory of kimchi for friendship and family and the resulting harmony of flavor from the unity of the individual ingredients. Something like that. The principle is very meaningful (you should watch the show to find out!). The song below is the extended version of the opening song for "Kimchi Family" and I adore it. I listen to it often when I'm in the kitchen making something or cleaning up. I hope you enjoy it! Note: Kimchi, a dish of pickled or fermented vegetables, is Korea's national dish and is rooted in tradition, history, and national spirit. There are a recorded 187 varieties (historically + currently), using cabbage, cucumber, radish, scallion or other vegetable as the main ingredient (it isn't always cabbage). Varieties can differ based on produce, season, region, and family. It's amazing! Kimchi is like a food equivalent to the oral tradition of stories; passed down and passed around, adapting and shifting to the situation, the teller, the audience, in the case of kimchi; the season, the creator, the eater, the environment, the season, so wonderful! I'm getting carried away (someday I'd like to visit the Kimchi Field Museum in Seoul). (Disclaimer! I feel like I need one!) The following kimchi recipe is very basic and my own rendition (hence the "me-style" part of the title below). This is the flavor & how-to that works for me. 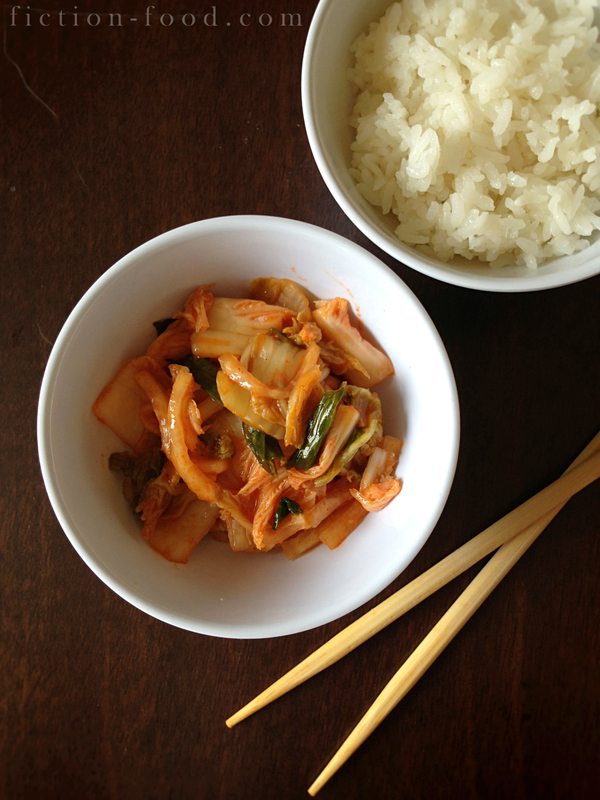 True to what I understand about kimchi with the many varieties and differences even in households, as well as the meaning of it that extends beyond mere consumption, I feel confident to share this recipe with you. 1. On a large cutting board, cut off the bottom of the Napa cabbage & remove the outer leaves. Cut into quarters & then cut further into 1" wide chunks, discarding the really thick, white bottom pieces. Put the cabbage into a very large bowl & add the salt, rubbing it into the cabbage well. You can toss the daikon matchsticks in at this point too or you can save them for addition later with the other ingredients. Cover the cabbage with cold water & then place a large plate on top, weighted down with a few canned goods, & let sit for about 2 hours (the cabbage [& daikon if you add it] will get tender & some of the bitterness will leech out). 2. Reserve 1/2 cup of the salt water brine that has been created & set it aside (this is for use if you decide to put your kimchi in a jar). Drain the cabbage (& daikon if you put it in) & rinse about 3 times to get rid of the residual salt. Squeeze & pat dry with paper towels & then put back in the large bowl (rinse & dry the bowl first). Add in the green onion pieces & daikon sticks if you didn't previously, as well as the optional carrot matchsticks & leek pieces. 3. Add all of the paste ingredients to your food processor (more or less red pepper paste depending on your spice preference) & whiz around until completely combined & you've got a lovely red paste. Empty the paste onto the other ingredients in the large bowl & massage it in by hand (you can wear food safe gloves to do this but I used my bare hands with no probs.) until everything is evenly coated. 4. The kimchi can be eaten right away (fresh) or stored in an airtight plastic container & put in the fridge (semi-fresh) OR stuffed really well into a large, clean glass jar & let sit on the counter for a couple of days (fermented). If you go this route press down on the kimchi as you're putting it on the jar so liquid comes to the top & covers it. If there's not much liquid in the jar pour in a little bit of the reserved brine, enough to cover the kimchi. Put the lid on the jar but don't screw it on too tightly (you want some of the gasses to be able to escape) & leave the jar on the counter, checking each day (sneak out a piece or 2) for desired flavor & tenderness. Mine took about 3 days. After that, place the jar in the fridge. 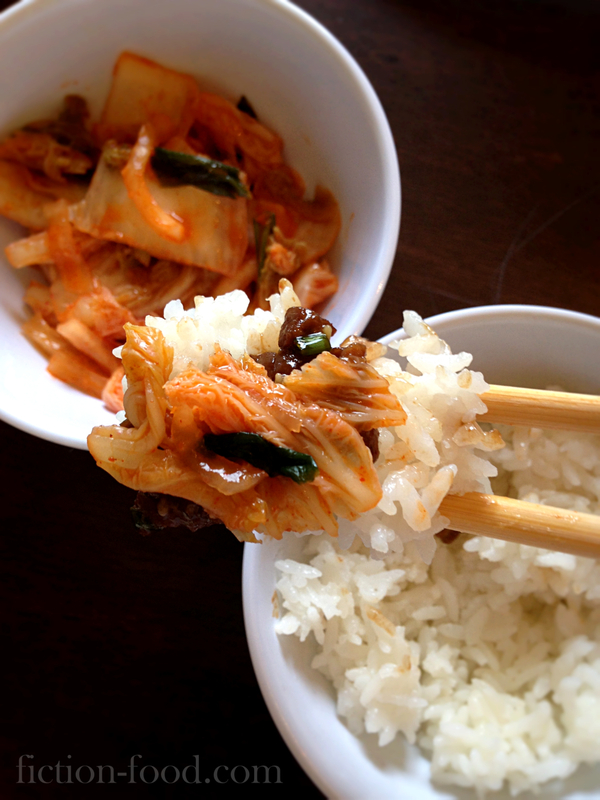 Serve your kimchi as a side dish or combined with other ingredients like rice or soup (so many possibilities!). Absolutely wonderful with strips of steak.